I promised that I would dig out some historic photos of Mülheim’s Schloßstrasse – here’s one from Summer 1964 I found in the 35mm negatives. 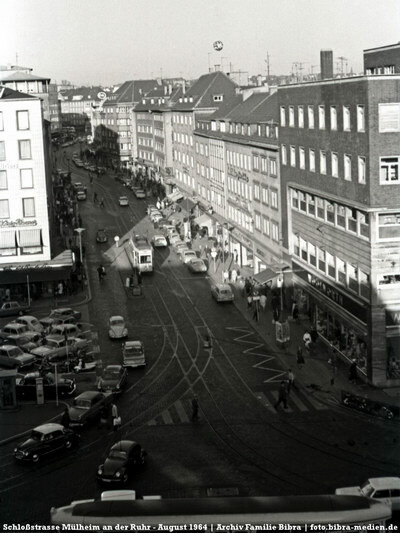 It was shot from the visitor’s terrace of the Kaufhof up the street, back when it still was a street with cars and the tramway running through it! On the right you can see the Woolworth corner building visible in some of the previous photos, but it looked very different back then. The only other shop signs I was able to identify are WMF (cutlery and tableware) and C&A (clothes) and I have no idea what that balloon floating over the houses was doing there!